The 70” Full Vision Glass Front Display Case - Ready to Assemble with Antique White finish is a modern classic that will give you years of affordable elegance and dependability for your retail store. Our ready to assemble case offers a number of features for your money that you will be happy that you took advantage of. 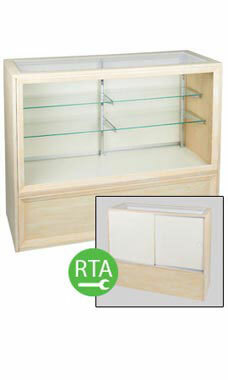 Our ready to assemble display case features a durable wood grain finish with tempered glass top and front. Additional features include two rows of adjustable 1/4" split glass shelves 8” and 10” depth, steel interior standards and shelf brackets.